Back from my yearly sojourn to my childhood home in New Mexico, I’m picking up where I left off with photographer Victor Brigola’s series of urban infill churches. The first in the series, a picture of the church of the Katholische Pfarrgemeinde St. Petrus, can be found here. 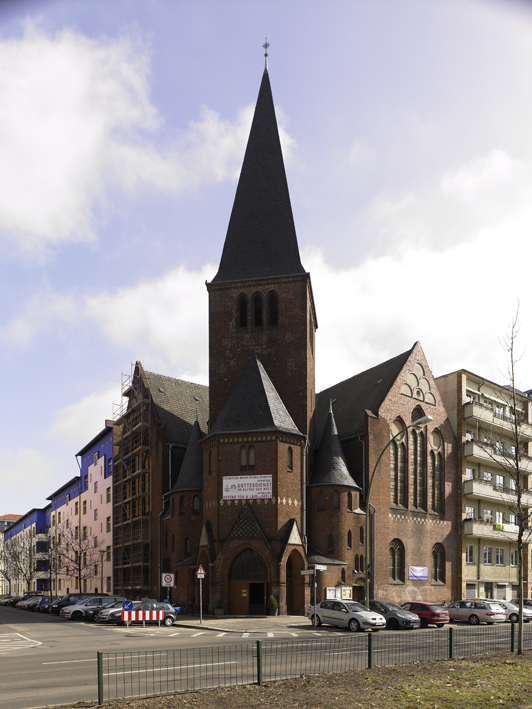 But today we’re looking at a protestant heap of bricks on Danziger Straße. Though sober in its rendering of materials, there’s nonetheless a fairy tale/warped dream quality to it. Dramatically clashing chunks of geometry combine in the name of spiritual whimsy. The result is intriguing, though not exactly something that beckons me to join in on Sunday mornings and pray to Jesus.